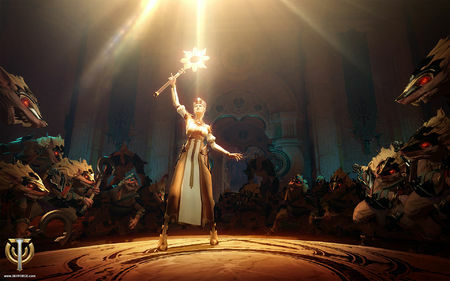 In Skyforge the Lightbinder is actually a support hero, but also can do a lot of damage. We show you the optimal skill selection for the Lightbinder in Free2Play MMORPG from the team of Allods Online and Obsidian Entertainment. The Lightbinder is a very interesting support class that strengthens his allies with light and laser beams. This makes the Lightbinder as a solo class a lot of fun. The Lightbinder has strong light magic, which acts like a laser. Therefore, you can attack with his primary Twitching shimmering emit short laser pulses or generate an extremely strong, lasting laser beam when you hold down the left mouse button. With the right mouse button it also generates short pulses damage or a charged ball of energy, which attracts all the enemies. With these basic skills you can already do a lot of damage. You should pack with these skills, if you want to build an offensive Lightbinder who burns away everything with lasers and light magic. Unstable Shield Creates a force field, which has 12.5 percent of the life energy of the light keeper and is twice as effective an ally. Shine Increased armor for the light keepers and be allies. Wrath of the sun Throws enemies back and aimed at harm. Wrath of stars Summons three stars, which attack your enemies. Quasar Land damage, which attracts enemies and stuns. - Stabilization of the quasar: Improves your Quasar. - Rain of Fire: Unstable Shield now has no cooldown, but requires sign charges that I regenerate slowly. - Radiant fragments: An exploding shield does double damage. These skills you use mostly by protect yourself always with your shield and Unstable make anger of stars for support. Further uses luster to maximize your damage and open the battle with sparks of wrath. Further use Quasar and the necessary damage emission. Skill latter invite with a little luck back on by running your standard attacks. Increase opponent’s sizzles way even with your primary attack.